Fury first came to my attention about six months ago after mentioning Scotland Yard in one of our podcasts; a family game from Ravensburger that I played with the folks when I was, as the Beatles say, so much younger than today. 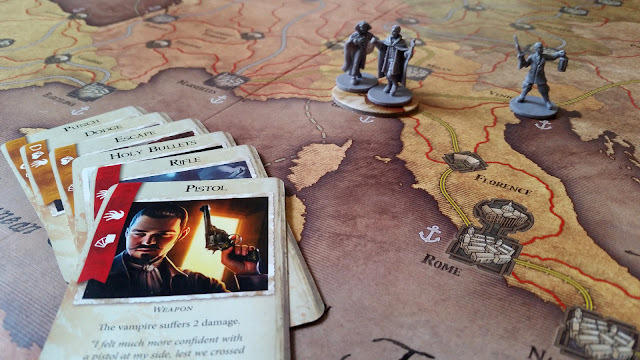 Fury of Dracula, like Scotland Yard, is a one vs. many game where Dracula is trying to elude capture and defeat at the hands of a group of hunters whilst trying to spread panic and despair throughout the cities of Europe. 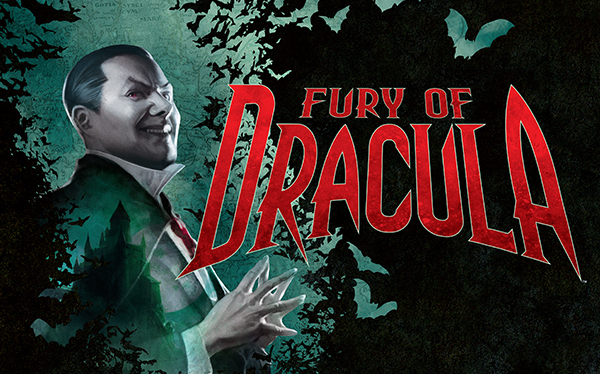 For those of you who are familiar with the Bram Stoker classic, Fury is pretty close to the book’s canon in terms of characters. Aside from the big D, the hunters consist of John Seward, Lord Godalming, Lady Harker and of course, Van Helsing. Although this time, he’s not an Aussie with a penchant for bearing his claws whilst riding a Harley. On the face of it, Fury of Dracula is a pretty simple idea – run about the board from city to city avoiding capture and laying traps if you’re playing Dracula, or trying to find and defeat Dracula if you’re playing one or more of the Hunters. The game scales well as if there’s not enough players to play a character individually, one player can play more than one Hunter as they’re all in play no matter how many players. Each Hunter has a couple of special abilities to aid them in their quest such as being able to carry more kit or to heal other Hunters faster. Dracula himself also has a few tricks up his sleeve – with his main goals in the game being misdirection and subterfuge. 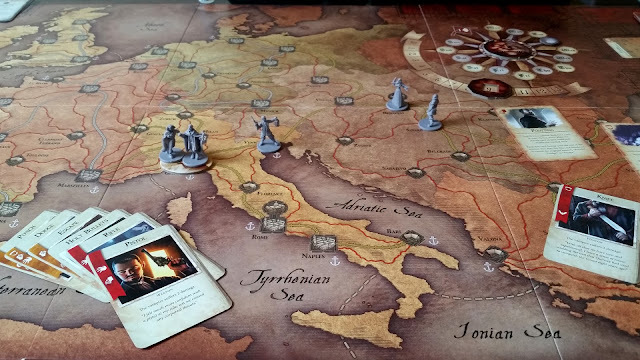 By moving about the board, he sets up hideouts, unknown to the Hunters, which he can set up ambushes in the form of lesser Vampires or just a stereotypical angry mob with pitchforks and torches. 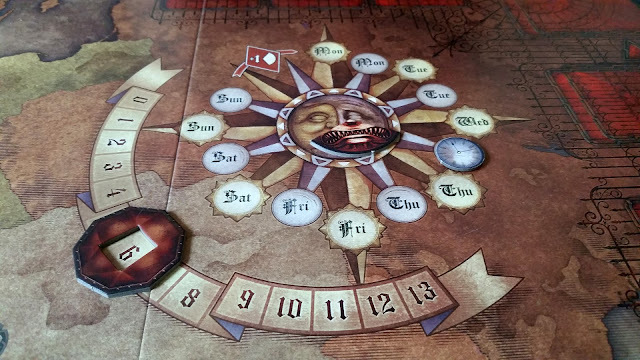 Dracula’s whereabouts remains on the board (known as his trail) for six turns, after which he can mature a hideout which usually means bad news for the Hunters or turn it into a lair which, again, isn’t going to fill the Hunters day with sunshine and roses. Ultimately, Dracula’s goal is to fill the influence track at which point he wins. The Hunter’s job is simple – find Dracula and defeat him in combat. Which brings me to the fighty bit. Combat in Fury can best be equated to Rock, Paper, Scissors (no Lizard or Spock) as each combatant has a series of cards with symbols on; the symbols representing certain kinds of attack or counter and each card has a few of them on. Each player chooses a card to play and if they match, the Hunter wins and gives Drac a good kicking. If not, the Vampire wins and usually ends up doing something unpleasant to those involved. I liked the combat, but as Polyhedron Collider’s own Steve points out – without knowing what you’re up against the first time around, it’s very hard to know what to play. The game certainly needs to be thoroughly looked through before it’s played so everyone knows who’s got access to what. This is especially true of the Dracula powers. Good Old Drac gets five powers at his disposal which help him out of tight spots. He can play these instead of popping a location on his hideout track to either throw folk off the scent or, more entertainingly, bail out altogether and move somewhere else. A manoeuvre I found particularly entertaining when I played against a set of hardened gamers trying to hunt me down. Although, as the Hunters pointed out, the “Misdirect” power seems a little too powerful as it, in theory, could be used nearly every turn which gave the Hunters little to no chance of finding the Vampire. However, defeating the Hunters is one way of increasing his influence so simply running away every time doesn’t let you do that. In other words, Dracula will need to man up at some point, so the power is balanced in that sense. It’ll get you out of a hole, but it won’t help you win. I found the game to be quite a different experience with changing groups of players. The hardened gamers were quite effective Hunters as they communicated well and found Drac quite quickly (either that or I was a lousy Count, perish the thought). For the more casual or occasional set, it took longer to latch onto where Dracula had rubbed his greasy mitts. Game length was heftier than expected with a full game taking up to six hours – although with more familiarity, this could probably be trimmed down to three to four. 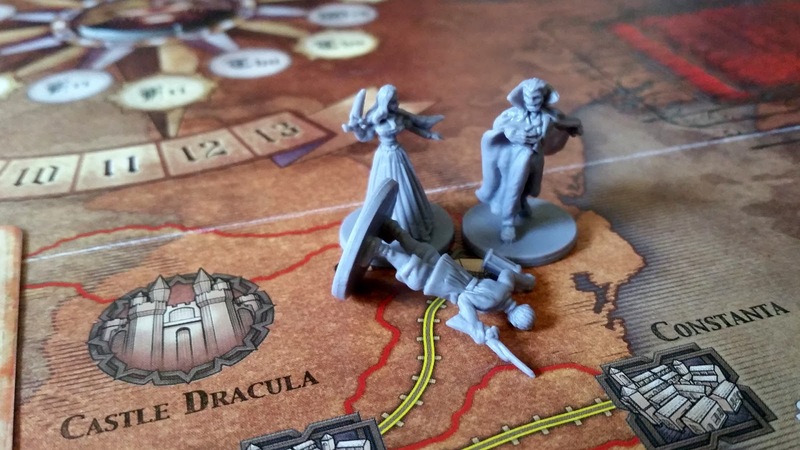 The longer the game lasts, the more chance Dracula has of winning, so it’s in the Hunters’ interests to hustle. There’s a great sense of tension when the Hunters are bearing down on the Count – something I personally enjoyed when playing as Dracula. There’s also a smug sense of satisfaction when the Hunters get it wrong and don’t find you when expected. The Hunters side of things needs to be quite methodical and organised – there’s usually a few ways our sanguine-dependent antagonist can slip through the net. That said, there’s an enormous feeling of success when you eventually lay the smackdown on the sharp-toothed bad guy. It’s probably obvious, but I enjoyed Fury of Dracula a lot. It probably says a lot about my personality, but I enjoyed evading capture and conceiving well-laid traps for others to fall into when playing as Dracula. But the team element of the Hunter side of the game is very enjoyable as you all work together to find the quite literal pain-in-the-neck and introduce him to the business end of a sharpened stake. Whichever side you choose, there’s something for everyone here and you won’t be disappointed.